My ranges show that river is a pretty clear fold. Did anybody get a different answer? I think it's a close call. Checking two streets takes most sets and two pair out of his range, but also lots of bluffs that would raise either flop or turn. I think V could also sometimes spaz river with TT or two pair trying to get value from AK (because of course he puts us on AK). Curious what hands you have V calling instead of raising on flop. I think that's the key to this hand. I remove most combos of sets on this wet board. I have him calling some gutshot combos, raising others. Same with diamond / backdoor spade draws - raise 50%. Would you call $150 more? Need 45.4% equity. Our hand has 43.5% against this range. In practice, since this is a “spewy” V, I’d expect him to bet at least some busted gutshots. Call. @dmansen I think your math might be off on the equity needed to call on the river. You're calling $150 to win $110+70+220 = $400. You're getting 150:400 or 1:2.7. This comes to 1/(3.7) = 27% equity. I did, however--despite a different range analysis along the way--come to the same conclusion as you, which is that the river is a (close) call. NOTE: I decided to interpret "spewy" as playing tons of hands, not necessarily aggressive. This means that I have him not raising his draws, even big ones. I see his mentality as more like, "'Well, shoot, I call with naked gut shots, of course I'm calling with my flush draws!" (raising does not enter his mind). Specifically with the few royal draws he could have, he doesn't want to raise and have me fold--then he won't hit his royal flush! I totally get that spewy could mean playing draws aggressively, I just didn't go that route since I mapped this player as similarly as possible to the type of spewy players i come across in my player pool. I basically have villain shoving all his flushes and all of his missed backdoor flush draws. Calling $150 to win $110+$70+$220 = $400, so need 2.7:1 = 27%. I am 31% vs his range, so it's a call. I interpret spew to mean he calls a lot, but doesn't raise much and certainly doesn't have many bluffs in his range. By the river I have him at 83 combos, most of which crush me. I only have 23% equity, so it's a pretty easy fold for me. The quality off the handreading book would increase if there was some kind of definition of what exactly different player types mean. Ofc it's more about the analyze than the result, but discussing hands is pretty useless when everybody assigns different characteristics to the opponents because this influences the way we interprete their actions and thus with what they call, fold, reraise etc. just my 2 cents. Spewy is generally meant to describe a bad loose aggressive player who will do "spewy" things such as bluff hopeless hands too frequently. This is much different from a loose passive player who is more likely to bleed chips. expel large quantities of (chips) rapidly and forcibly. I took spewy terrible to mean that he is mostly a calling station who likes to make bad bluffs or over values his hand to much. I have him a HUGE range..
834 Combos, 63% of hands. 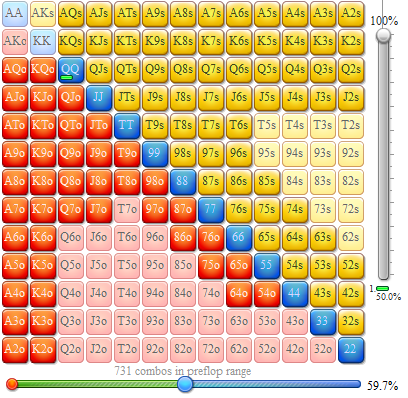 633 Combos, 47% of all hands, 76% of pre flop range. 99 -> raise?, but maybe he is so bad that he will call. 543 combos, 41% of hands, 86% of previous hands.. Hero bets $70, MP2 goes all in... What? Okay, I had him on a huge range, but what am I worried about; what beats hero? I have to call; I have a very good bluff catcher-> AAA; I would have to get a tell that he was very excited to catch that river calling down for me to fold with a gunshot / fd. If he has it, good for him. Seems like obvious call.. Ed Miller says fold when the big money goes in... But this hand almost doesn't make sense to do that. For me "spewy" is someone bleeding chips. I see it as a bad LAG (i.e. chasing too much and without consideration for position). Because of him being very passive (cold call) and suddenly waking up, I feel he paid to much to chase and (unfortunately) got it. Thus a call is for me -EV (-12$) and I would fold - is it too nitty?? . Only if I know him being able of going all-in with a busted draw I would call (and it would be a +EV call too). I see him playing with any "playable" hands: all broadways, all A2+ and K2+, J2s+ and Q2s+, all connectors/gapers/double gapers (except some offsuit) and broadway+any card for a straigt. he will call with a tremendous amount of marginal hands: top pair/double pairs (50%), any pairs (even 22), flushdraws, OESD and gutshots. The 5 doesn't change much. Again, he will raise 50% of "good hands" (except the ones he checked on the flop, continuation of his mind) and call with the other. He suddenly wakes up and raises all-in. I think he might bluff, but this T connects a lot with his range (flush, straight), especially with all his weak flush. This would be but the line of a P-Fish, maybe too nitty ? I would only consider calling if he is able of such move with a busted straight-draw, esp. with the T giving him a marginal pair (and it would be a +EV call). But I wouldn't dare to call before knowing him being able of such move, having seen it before. AX? I think this player would just call. There's nothing indicating that he raises AX for value here and for equity protection. He's rebought twice plays over half his hands and spews a lot so I think it is reasonable to say he has more of a passive calling tendency more so than raising/3betting aggressively. Flush Draws? Same logic as w/ Ax. I think this player likes calling ip w/ fd's vs raising. 66? Calls at least once. What would MP2 do w/..
99? Call. I think if he didn't raise AX on flop then he probably plays a set passively and in this case incorrectly as he should've raised it on flop for value to start getting money in building a pot. He didn't raise it on flop, he should definitely on turn but I don't believe he does. Non-Nut Flushes? I think he'd likely just call. Again there's no description indicating he takes any action aggressively. My read based on description is that he's loose and passive. So w/ the Nut Flush I believe he would jam all-in KdXd. Two Pair? I think he'd call with 2pair as well fearing being beaten to a flush or str8 maybe. Would you call $150 more? No. My reason is well because if I don't think he'd raise a hand like 99 and elect to just call w/ it instead and if his non-nut flush hands I think are only calling as well as 2pair just calling then I think the only part of his range he would jam ai w/ is nothing less but the nut flush KXd. If I thought he'd do this w/ 2pair, TP, Jx etc. then I'd have a massive amount of equity more than the required and I'd consider calling. But here in this specific spot I don't believe villain is bluffing and has the nut flush pretty much 100% of the time. Weak players do not bother looking behind them before they call a preflop raise. Given how wide this player has been giving action preflop, what do you think MP2 calls $10 with? Would you call $150 or more? No, I feel this is the type of player that calls hoping to hit something like a flush or a straight on the river and get it all in. I think I am behind his entire range here. My range for MP2 is more conservative, my understanding of the image of Villain is that he is playing a lot of hands but he is very bad in postflop play. It is quite possible to get a good run of cards in the first hour of playing, and if Villain is very bad in postflop play, it is not a surprise that he is spewing chips. Eliminated AA-QQ, AK in his range because Villain would have 3Bet with these hands. Villain's range misses the flop 73.8 %, so this put a lot of pressure on Villain to call a CB. Villain's range of the turn is the same as the flop' range, that is, he is continuing with 100% of his range. With the exception of the FD (16.7%) all the other hands we crush. According to Flopzilla, Hero's range is 83.33 % equity. Therefore a call on the river shove since the EV to call the shove is 27.27%. The interesting point of this exercise is that sometimes one gives too much credit to Villain's hand as to have hit the flush on the river. Yes, sometimes, this happens, but according to the percentages, FD on the river is only 16.7%, and all the other hands in Villain's range is crushed by AA. So, it is worth the risk to call this river shove. P.S. Looking at the range assigned to Villain, just realized that Hero's AA acts as a blocker to many Axs combos which Villain may have in his range. With this in mind, here's my revised range. Villain most likely to continue with FD, 2Pair, Sets, OESD. Turn, Villain's continues with 100% of his flop range. River, Villain's range: JJ,99,AJo,AJs,A9s,KdQd,KdJd,QdJd,8d7d,7d6d (83.3% or 15 combos). According to Flopzilla, Villain has flush 33% of the time. Still a call on the river shove. Interesting to read other members comments on this hand. From what I get, those who decided to fold on the river instead of calling for the remaining $150 believes that Villain completed a flush draw on the river. So my question for those of you who believe that Villain made a flush on the river is this: why would you bet $70 on the river instead of checking? It makes no sense to value bet on the river if you believe that Villain has made a flush on the river. It would be more prudent to check on the river because of showdown value if you believe that Villain has made a flush on the river. When you check on the river, Villain can decide on how much to bet on the river. He can bet different sizes or just shove on the river? So the question, would be if you check on the river and Villain shoves, does it mean a flush? Villain would not shove the nut flush or 2nd nut flush because he would want to get paid on the river because there would be very few hands to beat his hand. Poker is all about exploiting opponent's tendencies. If you always fold when shoved in this position, you are giving too much credit to your opponent, and he can exploit this with any two blank cards by shoving on the river when a flush draw completes on the river. certainly goes all in with all flushes... tougher question is does he do it with straights and 2pr. As he has rebought twice already I can see him shoving either of these most of time also. I would call on the river. He doesn't have straights in his range. 40% of his range will be flushes. 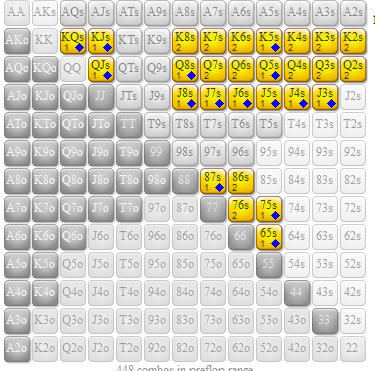 But this splashy player that already rebought in twice, will also go all in with 2Pair and even with 1Pair. Those hands are 60% of his range. I have to pay $150 for a total pot of $550. So my price is 27%. Flopzilla gives my equity with my Topset 60% versus his range. I crush all his 2Pair and 1Pair-hands, so I make the call. Preflop: It folds around to me in MP1 and I open for $10, MP2 calls. MP2 is spewey and loose. 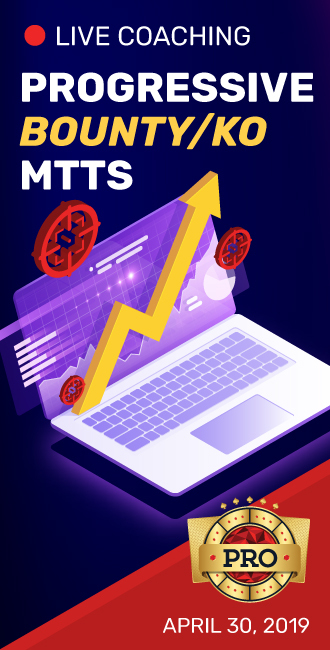 I think MP2 will throw $10 into the pot with just about anything but he is calling with a 29% range (356 combos) 88-22,ATo-A7o,KJo-K9o,QJo-Q9o,JTo-J9o,T9o,98o,87o,76o,65o,ATs-A2s,KJs-K8s,QJs-Q8s,JTs-J8s,T9s-T7s,98s-96s,87s-85s,76s-74s,65s-63s,54s-53s,43s. Everyone folds and I’m heads up with MP2. The flop gives me trip aces and I CB ¾ of the pot, MP2 calls. I don’t have a flush draw and he might. He is continuing with two pair, top pair fd and sd and he may be continuing with air. He is continuing with 29% of his previous range (69 combos) ATo-A7o,QTo,J9o,ATs-A2s,QTs,J9s,T8s,KdJd,KdTd,Kd8d,QdJd,Qd8d,JdTd,Jd8d,Td7d,8d7d,8d6d,8d5d,7d6d,7d5d,7d4d,6d5d,6d4d,6d3d,5d4d,5d3d,4d3d. He is calling with Ax, fd and 66. I bet $70 and MP2 goes all in representing a non nut flush or two pair such as AA TT. I am calling cause you don’t fold trip aces on a river bet. He is bluffing or he has two pair, or a flush or top pair. I rule out him having QT so he is continuing with 82% of his previous range (45 combos) ATo-A7o,J9o,ATs-A2s,J9s,KdJd,Kd8d,QdJd,Qd8d,Jd8d,8d7d,8d6d,8d5d,7d6d,7d5d,7d4d,6d5d,6d4d,6d3d,5d4d,5d3d,4d3d. V is gonna call ab bit more than half of his range here, I decided to include midpairs and weak pairs such as Jx/9x, he is the type of player to be sticky with second or third pair in an attempt to be lucky or later streets. On the turn, some of his Jxs/9xs are turning a spade flush draw. 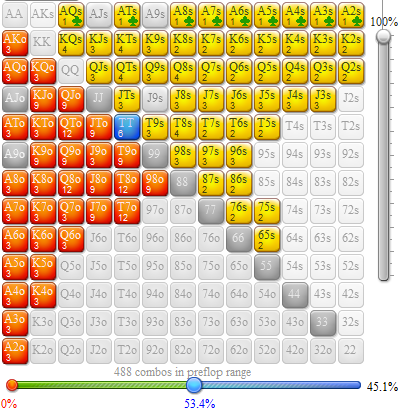 The flopped flush draw of diamonds are about 11% of his range, consisting of baby diamond flush draw, such as 32s+, but also bigger ones, like KQs/KJs and such. Now what could V have with this all in move? - 15% of the time he has TP with various kickers. - 7% of the time he has a flush. Plugging these numbers to Flopzilla, we see that the hands he would do that with are 60% of his range. Mathematically, this gives us a 90% Range advantage. The pot odds are 2.6 to 1, we need 27% equity to call, we should call. Feel free to send me your feedback by tagging me on your answer, this is how we all get better, by sharing point of views. I gave this villain a really wide range, I assume he is drunk basically playing everything if he is playing over 50%. 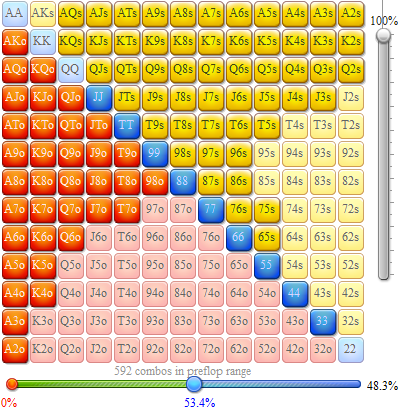 Their preflop range: 628 combos and 51.3% of hands discounting our AA. Since villain is spewy post flop I think he will continue with any pair and will be raising his FD/SD/2p+ aggressively. 58% of previous combos and 306 combos in his range. I think on this turn card that after we double barrel that Villain will just call. He will raise his 95s that turned two pair, but I expect him to raise most if not all flush draws on the flop, as well as his sets. He may raise AT here, I will discount that 50%. 47% of previous range and 144 combos. I think that villain will push with all of his 2p hands which are JT that improved on the river. I also gave villain the combos of J8, as I believe he has a spazz factor. Most of the range I put him on consists of straights which were the 87o gutshot he was calling for multiple streets. 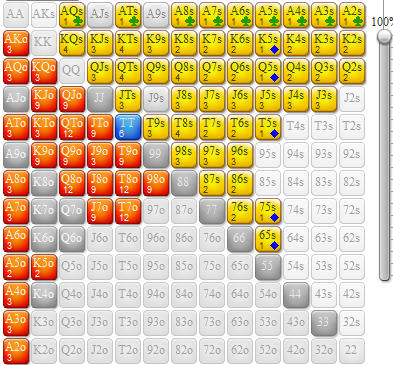 Against that range we have 57% equity WITH the spazz factor of him going all in with J8, and without we still have 57%. If we give him a few combos of flushes that he decided he wouldn't go bonkers with earlier in the hand, then our equity will be lowered. That paired with his spazzy factor though, this is probably a call. We are at the top of our range vs a spew.